I am so pleased to have Kay Butzin with us today, who placed in our Summer 2013 Fall Flash Fiction contest for her short but gripping story, Bank Job. Interestingly, Kay entered this story in WOW's Spring 2010 contest, and the critique she had received then inspired her 2013 winning revision! So, if you haven’t had a chance to read it yet, click on the story title then come back here to join my chat with Kay. She has some great advice to share. Kay's Bio: On Sunday evenings, after the weekend visitors return to Austin, Houston, and San Antonio, Kay Butzin takes a walk on the Rockport, Texas beach and celebrates getting to live where other people come to play. Retired from a career in human resources administration, she has served as secretary, treasurer, and president—twice—of the Rockport Writers Group. 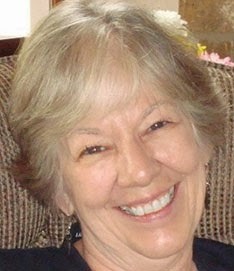 In addition, Kay writes interviews and articles for her biannual alumni newsletter; and her family and friends look forward each year to the original essays and poems she sends instead of Christmas cards. She is proud and honored to have “Bank Job” judged worthy of a Top 10 slot in the WOW! Summer 2013 Flash Fiction Contest. WOW: Welcome to The Muffin, Kay. We’re so happy to have you with us. Please share a little bit about yourself with our readers. KAY: I am a native Michigander living since 1995 in my adopted state of Texas, in a Gulf Coast community that attracts fishermen, birders, and artists. I have a handsome son, Scott, and lovely daughter-in-law, Anna, who enjoy organic gardening during their too-short Illinois summers. Scott recently celebrated fifteen years as an engineer with Caterpillar, Inc.
With a business degree from Michigan State, I worked in various administrative positions in both heath care and banking. I quit my last employer’s desk in 2000 and retired to my own to explore creative writing. WOW: How wonderful that you can put more focus on your writing now. It’s certainly paying off. You seem to really enjoy writing short stories and flash fiction. Do you prefer such writing over other genres? Can you give us some insight into perfecting quality short story/flash fiction writing? KAY: I’ve started a couple novels and a memoir or two, and they’re all packed away in various states of incompletion. I’m an obsessive reviser, which makes it difficult to get past the first few chapters of a book-length project. My short attention span better suits me for the flash genre, both fiction and nonfiction. I love the process of discovering a precise noun or verb to replace a 3-word phrase, and working within a word limit helps me to stop tinkering and call a story or essay finished. WOW: I can totally relate to being an obsessive reviser. It’s great that you found your writing niche. Your story, Bank Job, was one of my favorites. What I loved about it is that not only did you say a tremendous amount using very few words, it was also one of our shortest entries for the summer session. It truly blew me away. Please share with us how this story came to be. KAY: To submit a winning 250-word story to a WOW contest has been a goal of mine for some time. When I found Bank Job in an old writing practice notebook, I knew I could make it fit within that limit. I wrote the sloppy first draft of this story as a 20-minute POV exercise at a Rockport Writers Group meeting back in 2010. Having once worked as a teller myself, Kathy’s perspective was a natural choice. My subconscious happily offered up the surprise ending. WOW: Often the stories that pop up like that turn out to be some of your best work! And you certainly proved that. Do you have a daily writing regimen? How do you get ready to bring those stories out? I have a great writing partner and writers group, whose muster my stories must pass before I submit them. I read and reread submission guidelines so my work won’t be disqualified for not following them. Once I tell myself a piece is ready to go, I leave it overnight and check for errors one last time with fresh eyes before I push Send. And I aim to submit no less than one week before the official deadline. WOW: There are some great pointers in there for our readers. I hope they take note of them. Before I let you go, I would love for you to share any writing pearls of wisdom you might have for our readers. It’s not true that you can’t think of a single thing. You can think of hundreds of things—you just don’t like any of them. And what you like, you don’t trust. Another is the maxim, Writing is rewriting. I write first drafts by hand; and I used to waste a lot of paper, crumpling pages in disgust, before I learned to sift through my scribbles for the nuggets. WOW: Great pearls, Kay. Thank you so much for joining us here today and sharing some of your insight. Good luck with your future writing endeavours! We hope to see more of your work very soon.